US architectural paint demand is projected to expand 3.0 percent annually to 835 million gallons in 2020.The new residential market for architectural paint will register the fastest growth of any outlet through 2020. However, the majority of demand gains will derive from the residential improvement and repair market. Interior water-based paint offers the best opportunities for growth through 2020, while water-based paints will continue to gain market share from solvent-based types. 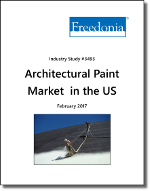 This Freedonia study analyzes the $11 billion US architectural paint market, presenting historical data plus forecasts for 2020 by market, application, formulation, substrate, end user, and channel of distribution. The study also details company market share and offers strategic analysis on industry players including Masco, PPG Industries, Sherwin-Williams, and Valspar.